We decided to go for broke and O Ya chef Don Pham did not disappoint. I’ve been going out for dinner six nights a week. On the seventh evening, I sloth out at home with tuna fish salad and the Sunday Times. Except for a few outraged tweets, I spare my readers the worst of the insults. If it isn’t really good or seriously bad, it won’t rate a BITE on Insatiable Critic. I will probably go back one day to Gunter Seeger. I loved the flavors and purity of his cooking, but in the early days, service had yet to distill. And I’m due to revisit Tapestry because I loved the fried chicken and the breakfast egg and chef-owner Suvir Saran is full of surprises. But for now, here are the 11 favorites I discovered in 2016. 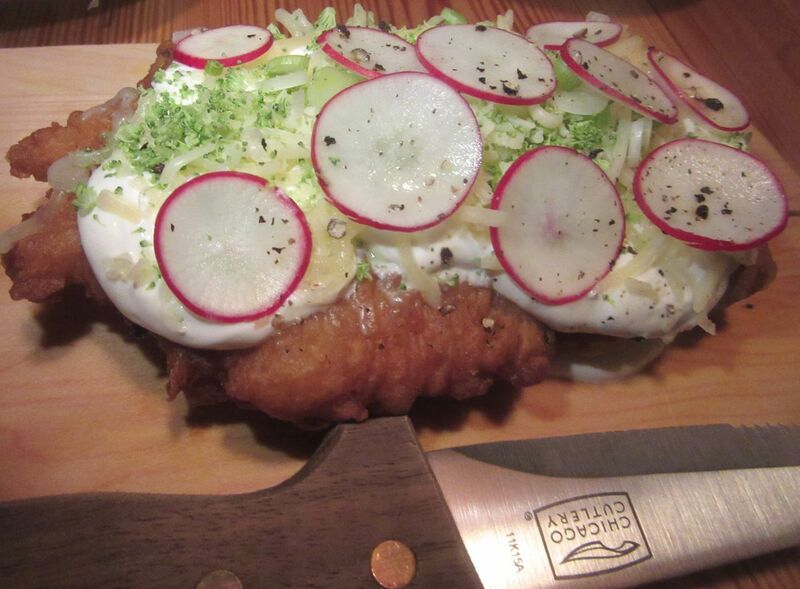 It's impossible to eat everything we've ordered at Nix after devouring Chef Fraser's potato fry bread. I count the vegetarian overdrive at Nix with its adorable, farmhouse-pinafored servers, among the best of my discoveries this year, even though greed for its rich vegetarian concepts left me groaning. Or maybe I mean “because” and not “even though.” Did my BITE (click here to read it) make that clear? Indeed, I loved it too much: the Yukon Potato fry bread, the rich-as-Croesus egg salad in a puddle of habanero mayo cream, and the cauliflower tempura with pickle to stuff into Chinese steamed buns. Such delicious and fanciful inventions by chef John Fraser provoked my tendency to overdo. I did say I felt blessed that Nix is far away on the other edge of town and I can’t just drop by habitually if seized by lust. Take that as a rave. 72 University Place between 10th and 11th Streets. 212 498 9393. It's Floyd Cardoz's way with bread that brings us to Paowalla where we always order Vindaloo pork ribs. Clearly, I have a weakness for bread. Bread happens to be a strength for Floyd Cardoz as New York learned long ago at Tabla. That’s why I can’t stay away from Paowalla, Cardoz’s celebration of Indian bread sellers. Sometimes, I start by covering the table with kulcha oozing cheddar cheese, and maybe a whole wheat roti too, plus a trio of condiments or possibly all six. The chef’s yogurt raita is chock full of chickpea crisps. Scrambled eggs -- with caramelized onions, ginger, and cilantro to pile on toast -- my favorite dish, is a must. 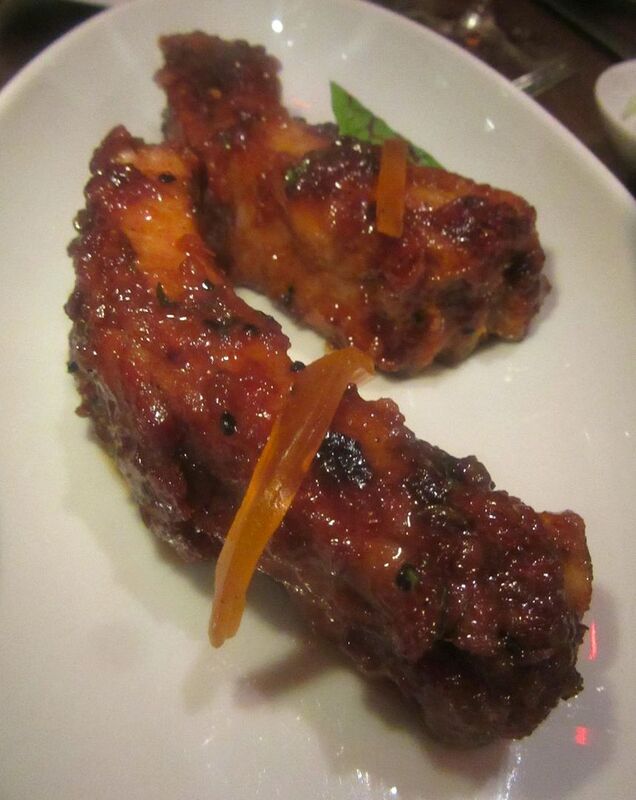 I don’t mind that someone always insists we order the vindaloo pork ribs, except that doesn't leave much appetite for the black spiced chicken with all its trappings. Bread fans and Cardoz fans discovered Paowalla the day it opened. Happily, the unholy din of a full house has been reasonably tamed by soundproofing. 195 Spring Street, corner of Sullivan. 212 235 1098. 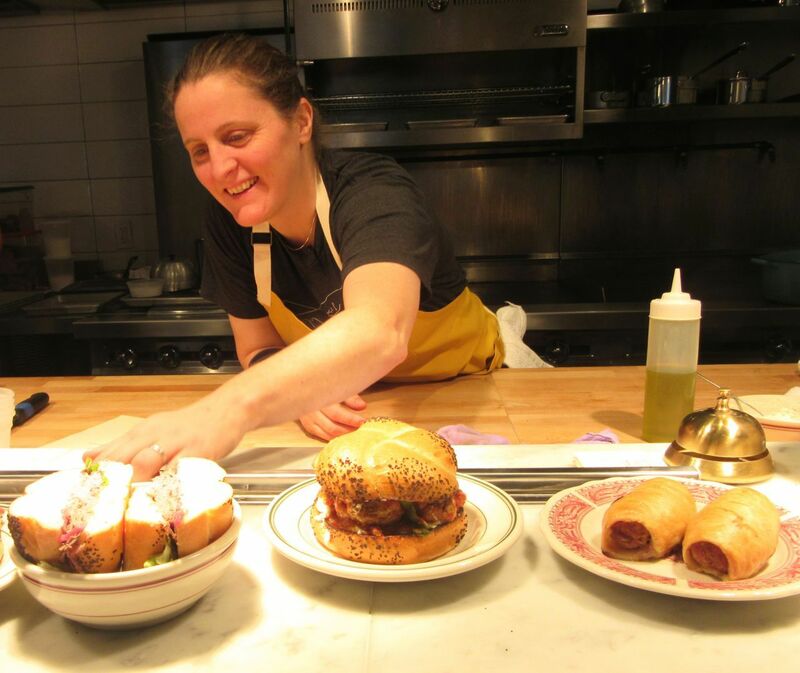 April Bloomfield never stops moving at White Gold Butcheres where sandwiches are made to order, of course. When April Bloomfield chose a corner on Amsterdam and 78th Street for her new White Gold Butchers, I took it as a vote of confidence in the Upper West Side. A friend who lives around the corner introduced me to lunch that first week: the crunch of little gem lettuce salad with chopped pistachios, excellent roast beef sandwich with red wine butter horseradish cream -- a sumptuous indulgence for just $8 -- and the messy $13 meatball spectacular sliding out of its poppy seed bun. I didn't get the broth mania til I tasted White Gold's blend of kabocha, Taleggio cheese and pumpkin seed oil. The first night of dinner, my friend joins us for a single slice of sourdough toast paved with radish thins on horseradish-spiked kefir cream, thick crusts of country toast to smear with chicken liver mousse and smoked lamb shoulder with sausage and spiced yogurt. No one can be surprised by the chew and flavor of a thick porterhouse cooked boldly rare. After all, butcher shop. April Bloomfield. But it’s the bone broth that has me swooning: a wizard’s potion of kabocha, Taleggio cheese, and pumpkin seed oil. There are moans and exclamations all around for this virtuoso $11 puddle. 375 Amsterdam Avenue, SE corner of 78th Street. 212 362 8731. 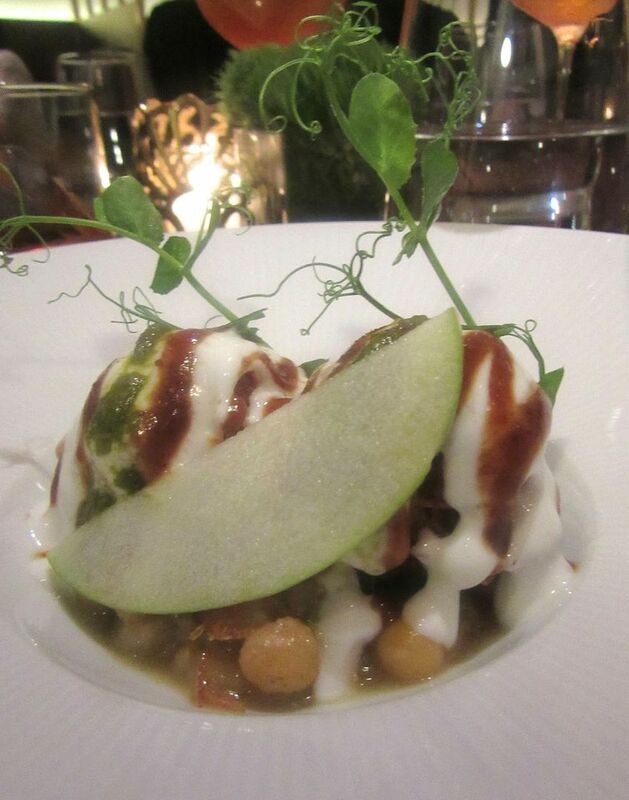 Everyone wants to taste the potato sphere chaat with white pea mash and yogurt dribbles. Indian Accent, an import with chef Manish Mehrotra of New Delhi in the rear of the Parker-Meridien, delivers blue cheese naan and pumpkin shorba in a teacup as an amuse with uptown élan and palatial trappings, in a three or four-course menu. We divide sweet potato shakarkandi with kohlrabi and crispy okra and the potato sphere chaat with its white pea mash and yogurt dribbles so all of us can taste. 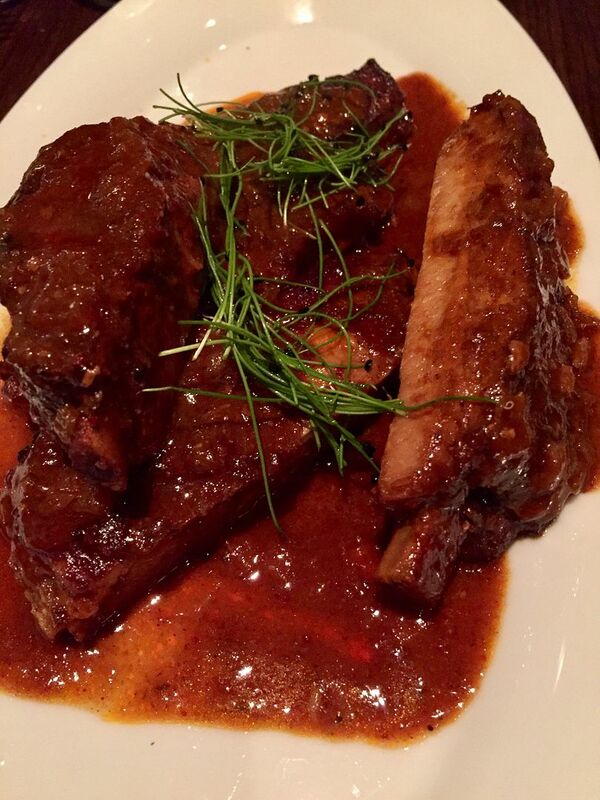 I had to order the sweet pickle lamb ribs on each of my visits to Indian Accent. Expecting samosas, my doubting pals marvel at sweet pickle lamb ribs and the duck Chettinad on an idli cushion in a $75 three-course menu of flavor bombs ($15 for additional courses). I order sweetly savory roast lamb in a wooden picnic carrier as an extra. I hope the small lemony popsicles as an intermezzo are for everyone and not just because I’ve been recognized. Mehrotra emerges from the kitchen, advancing with a toss of his head He knows just how good he is. It might seem surprising that owner Rohit Khattar has deliberately recruited a diverse staff of local servers, none of them obviously Indian. But the crew seems to have memorized everything one can know about each dish. Just ask. 123 West 56th Street between Sixth and Seventh Avenues. 212 842 8070. 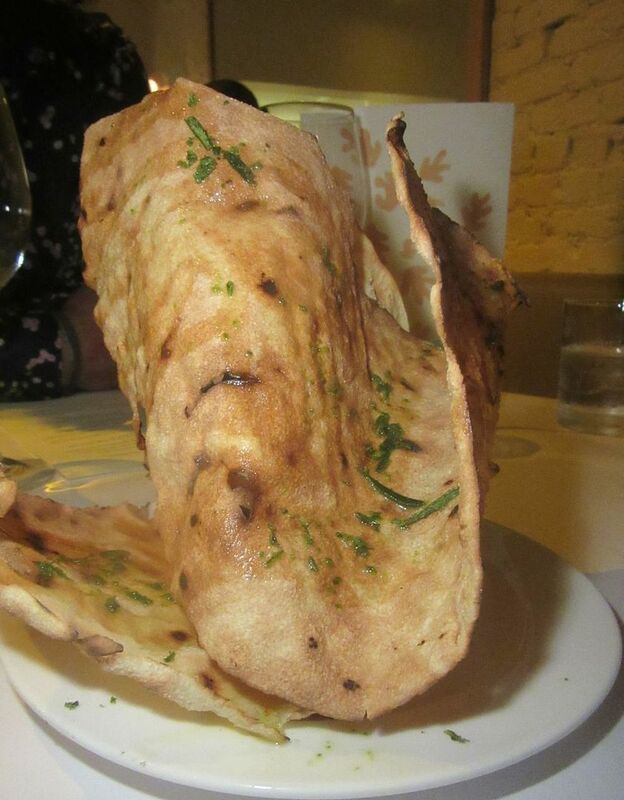 This sail-like crisp is the signature amuse of the new women's team at King. King is unique in its calm and confidence. Given a duo of women from London’s River Café in the kitchen and a third running the dining room, I decide it might be a feminine phenom. But chef Jess Shadbolt disagrees. “It’s more London,” she insists. There are cloths on the tables, undercloths, too, and small dishes of salt and ground pepper. The refined seduction begins with the toasted crackling crisp, like the winged sail of a toy boat. King's silken guinea hen for two could easily make three happy with all we've ordered. Elegance and simplicity reign. A perfectly cooked quail, maybe not as rare as I like it, is tender and juicy, bathed in a warm tapenade and festooned with watercress. These energetic London imports have mastered the Greenmarket, of course. Foliage gets a good workout on their very brief menu. Wilted dandelion lies across roasted honeynut pumpkin, with a surprise whack of peppery heat not totally cooled by crème fraîche. 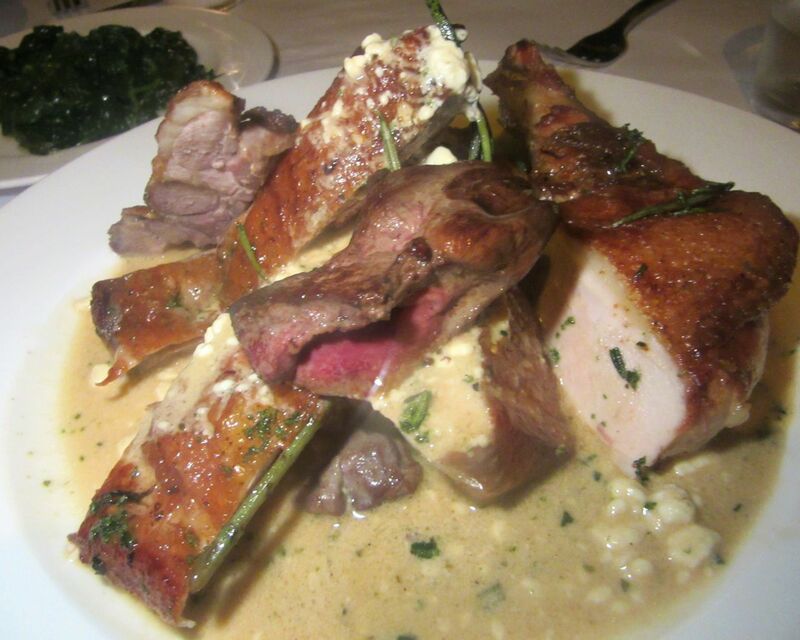 I’m longing now for a reprise of the perfect guinea hen. At the end, a server carefully pours Prosecco on top of the Concord grape granita. 18 King Street on the SW corner of Sixth Avenue. 917 825 1618. We're here for caviar but we don't want to pass up any chance for uni. My extravagant pal Wilfred persuades me we must have caviar. I suggest Caviar Russe, “the jewelbox boite,” on Madison Avenue. It’s a slightly déclassé one flight up. A guard stands under the narrow canopy at street level to open the door and summon an elevator, a not very elegant lift. I guess caviar is why God invented credit cards. It wouldn’t be safe to walk around carrying so much cash. After careful analysis of the menu Wilfred suggests we share the cut-rate “Classic Caviar Selection” for just $225, order two different $95 three-course dinners (sharing everything, of course) and throw in some à la carte items we can’t live without, like the uni and the raw diver sea scallop with caviar. I only realize I've been recognized when the kitchen starts sending out caviar on everything. I hadn’t expected to like the everyday dishes so much. An arched curl of kampachi is a miniature prelude. 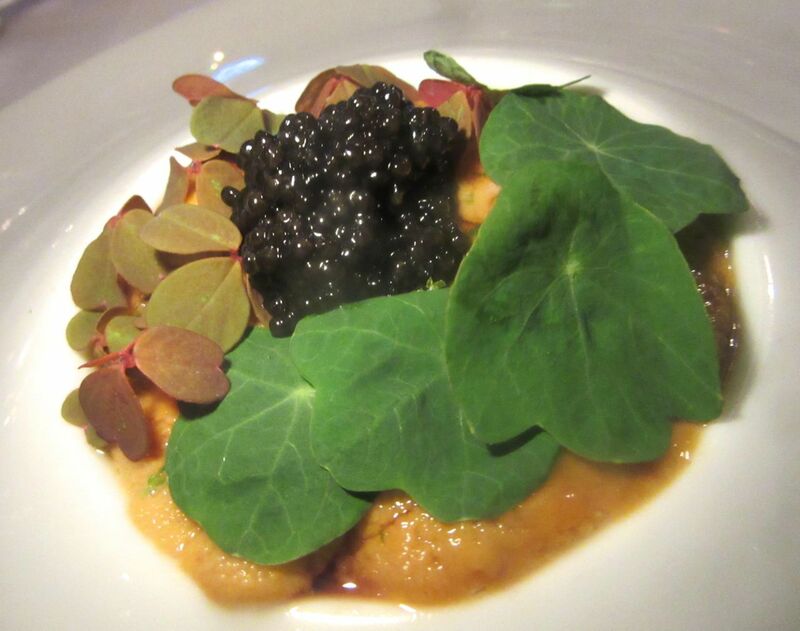 Then the $45 cluster of sweet California uni in dashi appears with nasturtium leaves and sorrel. A waiter pours soy-based sauce atop a tower of bluefin tuna sitting on an avocado base. “Umami,” he murmurs. And that’s luscious, too. 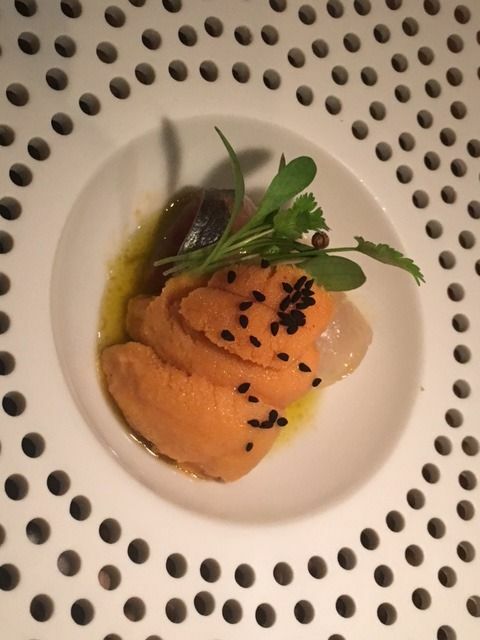 Sea urchin swimming in a yuzu foam seems to be a gift. “I think they know who you are,” Wilfred says, as he exclaims over his half of the crumbed soft-boiled egg from the tasting menu. 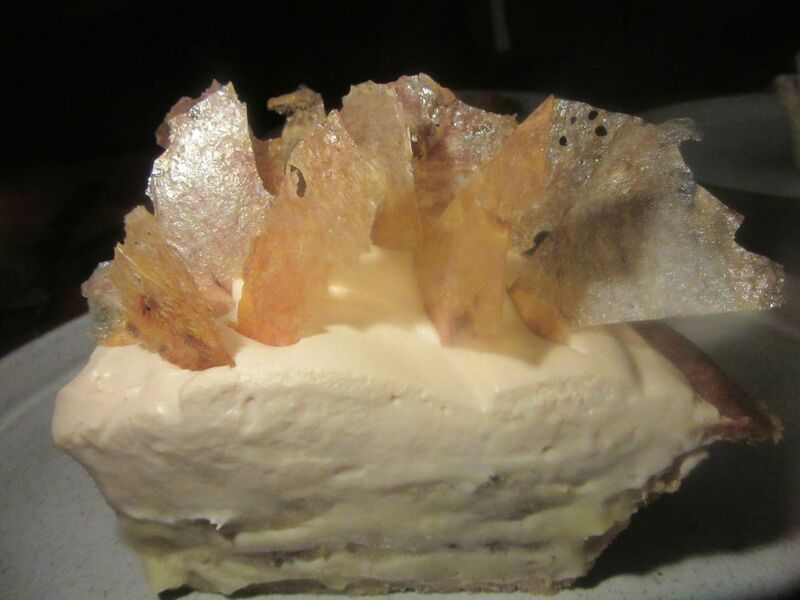 It rides in on islands of melted Parmesan cheese in a Parmesan cream under a generous tiara of caviar. You could come for the thrill of just this dish on the $95 tasting and not feel guilty about spending your kid’s college fund. And by the way, if you are financing the education of a kid or two, you deserve an occasional out-of-body experience at Caviar Russe. If you wonder, it was $335 for each of us. 538 Madison Avenue between 54th and 55th Streets, 2nd floor. 212 980 5908. 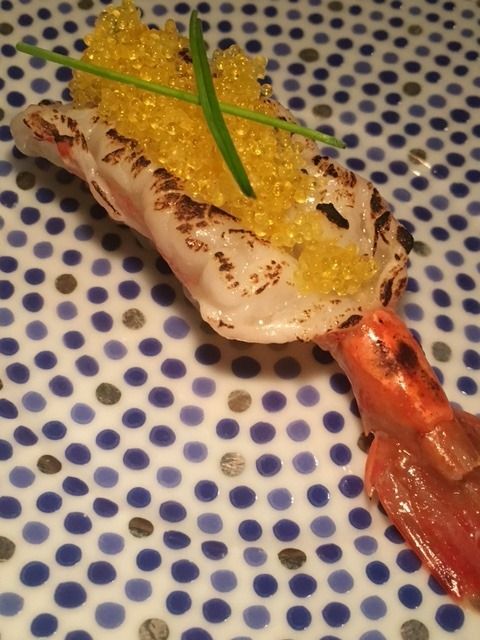 The silken wild prawn comes on the "Big Apple" tasting at O Ya. My friend Lauren and I got into a go-for-broke mood at O YA, ordering Okii Ringo (meaning “Big Apple”), 24 courses for $245. Hamachi sushi with a banana pepper mousse is followed by a sliver of King salmon slicked with Vietnamese rau ram salsa and caramel dashi. I can’t suppress an ummmm -- not a yummmm, but close. Not exactly traditional. The lead sushi chef, Don Pham, is Vietnamese. Perhaps that explains it. 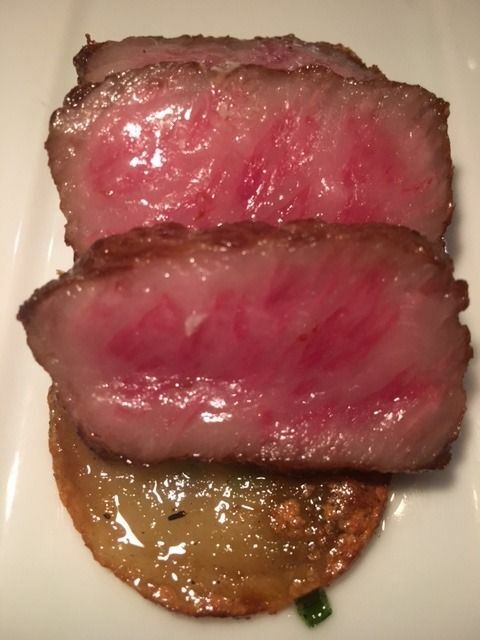 After the delicious excess at O Ya, I can only finish one slice of the seared wagyu. He next delivers sea urchin. 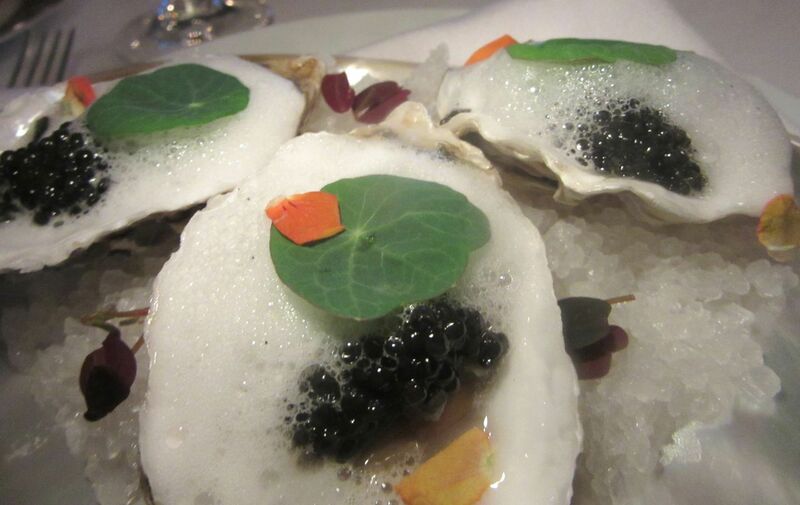 “Hokkaido from Japan with black river Osetra caviar,” he annotates. The warm, freshwater Japanese eel with the frizzle of Thai basil that follows has been painted with a sweet glaze and sansho pepper, then grilled -- an astonishment. Its sweetness and the heat fill my mouth. After that, the small saddle of rice, wearing nothing but a fingerling potato chip and Italian black truffle, seems daringly clever. And O Ya’s exquisite little omelette is cooked to order in wagyu schmaltz (that’s what it says on the menu, emailed the next day). Our lavish Okii Ringo moves along quickly with a staccato of highs. For me: A fried kumamoto oyster on a sushi tuffet with a citric aioli and a nimbus of squid ink bubbles. Bluefin otoro with fresh wasabi, green onion, and nasturtium. 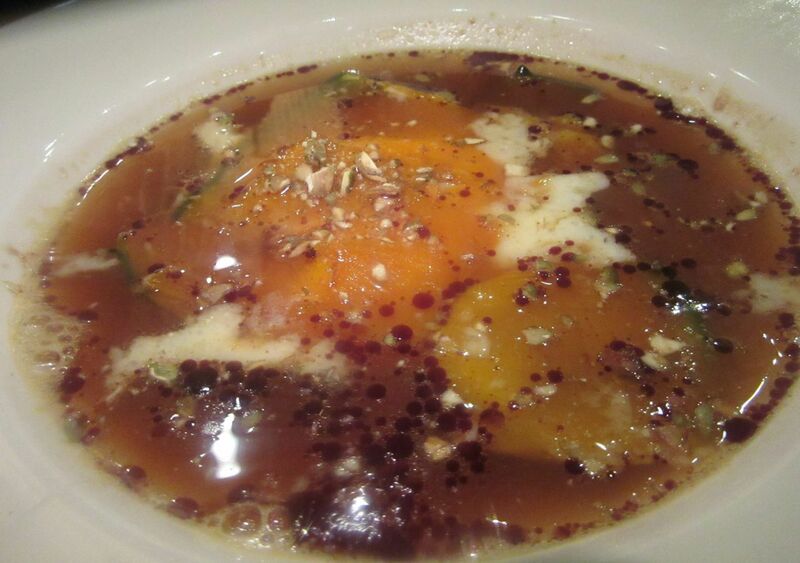 Clam dashi consommé is specifically timed to “get you ready for the hot dishes.” One amazement follows another, all on a collection of very fine plates. For each of us, $338. As I said, no regrets. 120 East 28th Street between Park and Lexington. 212 204 0200. 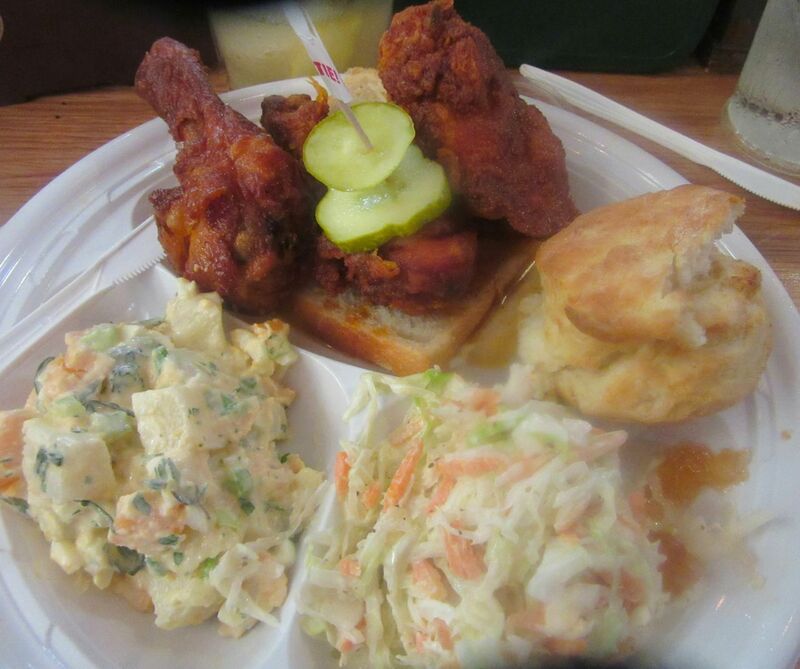 My plate at Carla's Southern Kitchen: torrid chicken with cole slaw and potato salad to satisfy the mayo need. I can appreciate a Ritz cracker -- and a little plastic cup of pimento cheese to spread on it. Five of us have convened in Brooklyn to explore the various levels of heat in the Nashville-style fried chicken at Carla’s Halls Southern Kitchen. Carla herself is there, making sure we try everything. There are only 28 seats, and you may not find the charismatic star of The Chew in residence, but I say, go anyway. Study the six “Hoot’n-Heat levels.” I’m having “The Jefferson,” a leg and a thigh, with two sides (potato salad and cole slaw) and a biscuit -- butter and jam $2 extra. I consider ordering the bird extra fiery. But then, weighing my affection for Szechuan spice, the age of my digestive system, and my need for seven hours of sleep, I switch to “Hootie Hoot” hot, number 4 out of 6 on the swelter scale. I bite into the tiny leg. It needs to cool down a bit in temperature, but it’s juicy, crisp, definitely fesity, even faintly torrid -- just right for me. And best of all, it’s remarkably greaseless. Dessert comes in plastic, too. (Lots of packaging, no dish-washing.) We’ve been talking about going back again and again. 115 Columbia Street in Cobble Hill. 718 855 4668. I prefer the duo patties on the classic burger with a side of chili at Salvation Burger. The local meat is aged in-house and ground by the resident butcher. The crew smokes the hot dogs and brines the pickles. Supposedly, they even make the cheese themselves. The sesame potato buns are bespoke. 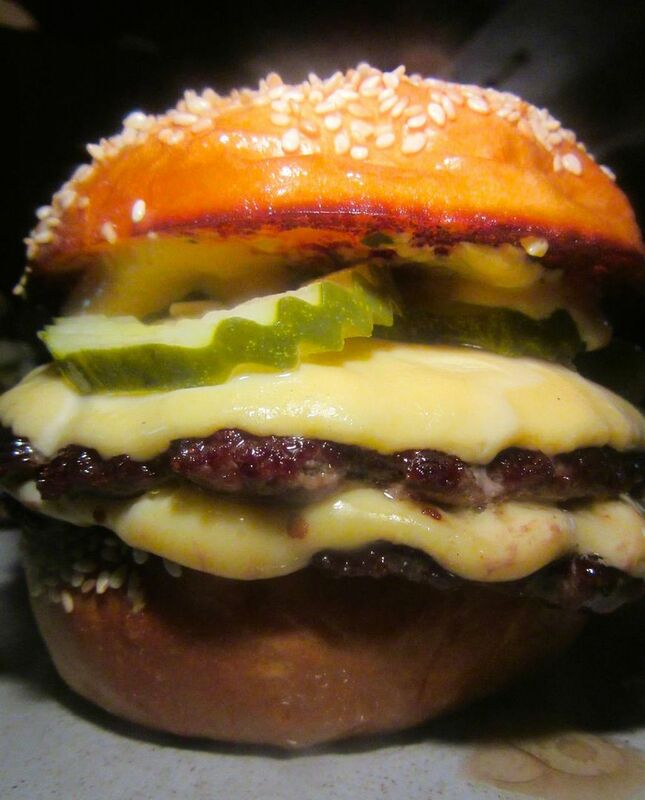 Everything at Salvation Burger is cooked and stuffed, tossed and layered to order. The chili is a rich stew with sour cream swirled and crushed corn nuts hidden under a toss of cilantro, shredded Tickler cheddar, and radish. I’d come back just for that chili and the banana cream pie. The catch is, there are no reservations, and most of the seats are unpadded backless stools. I've been ranting that no one does enough pies when Salvation Burger arrived with this symphony in banana. There’s a towering fishwich and a veggie burger too -- but then, you don’t come here for the inauthentic. Fries are first rate and so are the salads. Classic cocktails and boozy milkshakes may help you forget the endurance test. Never mind, nothing-but-rare-burger fans, the Classic duo of thinnies, my choice of the burgers, will be juicy and complex, maybe even sweetly caramelized on the edges. And then there are the pies. Who else does old-fashioned pies? Banana cream is my favorite. The Peanut Butter S’mores pie, not on the menu, is already legend. The Pod Hotel 51, 230 East 51st Street between Second and Third Avenues 212 355 0300. 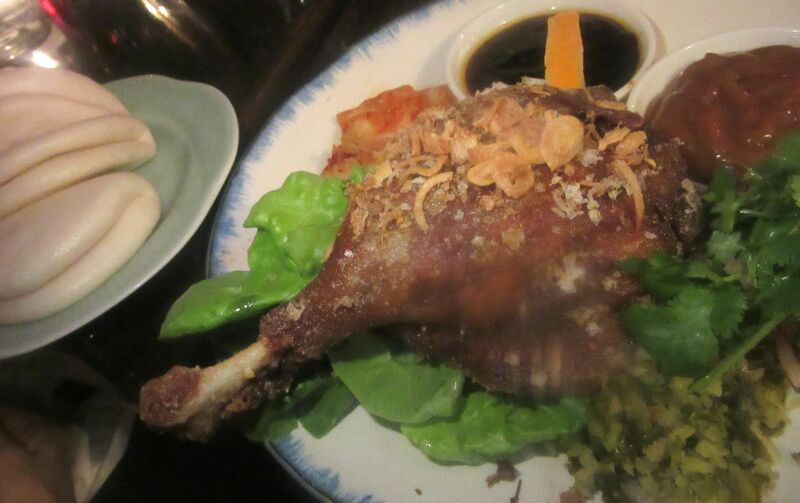 Chaan Teng is peaceful and reasonable with wonderful twists on Chinese classics like this duck confit. The peripetatic Pichet Ong is “the creative consultant” in the kitchen at Chaan Teng turning out real and fanciful Chinese dishes for the executive chef based in Washington, D.C. The partnership has led to pleasures like brilliant confit tomatoes with preserved plum granita, spicy mayo-swathed chicken skin dumplings, and the fire of crunchy vegetables mala. Spice loads are indicated on the menu so no need to be surprised. I’ll be back for another go at General Tso’s fried chicken, wild honey walnut shrimp, and the confit duck leg with Peking duck buns and hoisin sauce. Allegedly torrid drunken noodles are not too hot for me. An interior decorator partner is responsible for the charming Tea House of the August Moon look with pierced screens separating tables, a boudoir lamp, blue and white vases on shelves, and other flea market and vintage Chinoserie. The place is peaceful and reasonable. And there’s a collection of Chinese erotica en route to the restrooms. That does not quite make up for the lack of a liquor license. 698 Ninth Avenue, SE corner of 48th Street. 212 235 1886. 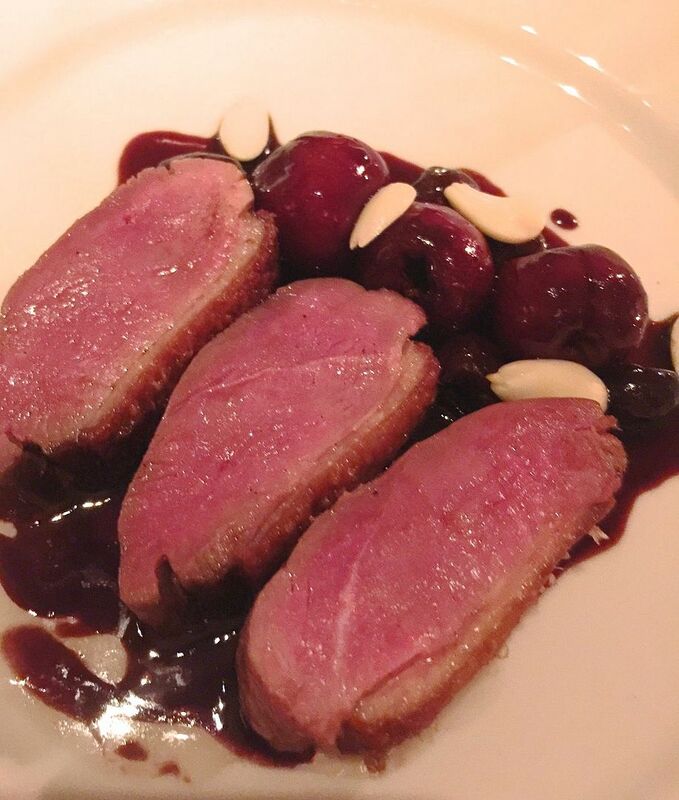 Thick slices of rare duck breast with cherries won me early at Le Coucou. I was quickly won by the elegance of Le Coucou. The spiffy bar, the tablecloths and tapered candles against brick walls, the handsome chandeliers almost hiding the splotched unfinished ceiling. I‘d never tasted Daniel Rose’s food at Spring in Paris but like many who fell in love with his cooking there, I was confused by his focus on old-fashioned French food in his American debut. I was surprised by Pete Wells’ three stars in the Times, through the veal terrine, the thick slices of rare duck and the steak and were always impressive, and as time went on, everything got better. On my last visit a friend and I happily shared the rabbit three ways. Now that I’m sufficiently enthusiastic to plan a return, it may not be easy for you or me to get in. 138 Lafayette between Howard and Canal Streets. 212 271 4252.